Previously on Victoria: Victoria and Albert were married, and really enjoying themselves, if you know what I mean. Francatelli did Miss S a solid and admitted he has feelings for her. Albert searched for a cause and started to make nice with Robert Peel. Unsurprisingly, Victoria’s knocked up, and she does not receive the news with unmitigated joy. It’s not because she hates kids or anything, but because she’s terrified. Rightly so, since she keeps getting reminded (and reminds herself constantly) that the only reason she’s queen is because Princess Charlotte died in childbirth. Horribly. Really horribly. And it’s not like things had gotten all that much better in the intervening years. Victoria also resents everyone treating her like she’s some sort of invalid who needs constant naps and mushy, unpleasant food. Now that his entire purpose has apparently been fulfilled, Albert really needs a new project. The poor guy’s chomping at the bit, but Victoria still won’t let him do a damn thing. So he sets about educating himself, getting super interested in industry throughout Britain and taking a particular interest in the railway. Victoria’s bored at home, so she decides to head north for a little while and stay at the home of a complete douchebag Tory who also happens to be a neighbour of Sir Robert Peel. 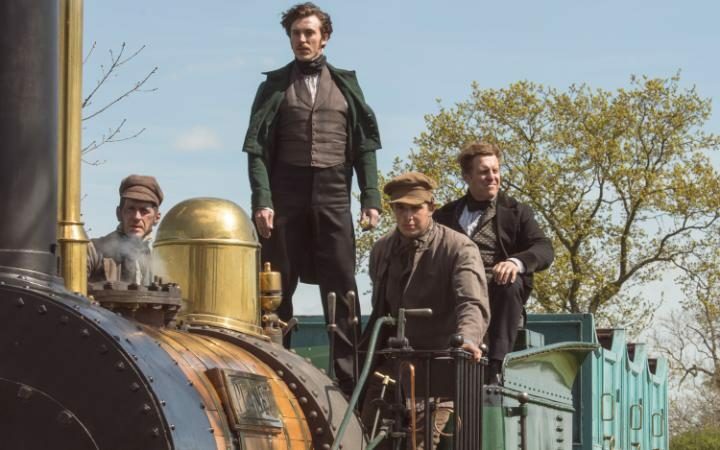 The host is a pill and a half, as is his wife, but Peel and Albert are getting on famously, and Albert’s super excited when Peel mentions he has a railway on his property. Victoria tries to shut the whole discussion down, but Albert sneaks away early one morning so he can take a ride in this little railway, which he finds a fairly invigorating experience. Victoria is so miffed at him for going she can’t even bring herself to eat her beetroot. They end up arguing about it when he gets home, and then Victoria goes to stomp and pout and then suddenly decides she wants to give the railway a go as well. She takes a ride and thinks it’s pretty great. When she gets back to Buckingham Palace, she orders the food she wants and finally starts sharing her workload with Albert, passing along all the industry-related paperwork to him. It’s actually kind of sweet. Also, now that they’re besties, Peel throws his support behind Victoria’s plan to name Albert regent, should she die in childbirth but bear a living child. On the servants’ side of things, Francatelli is making the moves on Miss S, wooing her with the magic of chocolate and then setting out a really elaborate table to debut his new dessert. He does this in one of the main rooms of the palace and nobody has an issue with that, despite the fact that the Duchess of Kent is still around (having been left behind during the northern progress) and would have probably objected to the servants conducting their dates right in her parlour. But whatever. Miss S thinks Francatelli’s novel new pudding–an ice-cream-filled bombe–is amazing and even suggests it be called a ‘bomb surprise’ because it looks like a bomb. Even though it doesn’t look like a bomb from this or any other era. It looks like a cannonball, but that doesn’t really roll off the tongue, does it? And it looks like something might be blossoming between Albert’s valet, Lohlein, and Victoria’s dresser, Mrs Jenkins. Lohlein gets caught in one of those stock moments where members of the household staff try to convince the foreigner to pass on bad info to his boss in order to embarrass both boss and employee. This is such a ridiculous and overused bit of nonsense even the show seems tired of it, and chooses not to play along. Jenkins intercepts Lohlein before he can dress Albert inappropriately for shooting and gives him better advice. And then they have a little chat in the garden.